Click here for a running list of volunteers that keep HCT running! Volunteers lead, free guided walks throughout the year. You pick your topic of interest, favorite conservation destination, and time of year. We add your walk to our quarterly schedule and we get the word out. It’s fun and is one of the best ways to connect folks to our land conservation mission. Small groups are organized throughout the year to survey and mark HCT land boundaries. 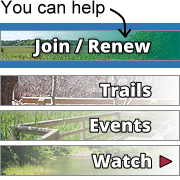 Help us monitor or maintain properties by visiting nearby sites to evaluate or address stewardship needs. Volunteers are matched to places that meet their interests and abilities. More than 30 places still need monthly volunteers! Monitor a local herring run by counting the fish as they climb to their freshwater spawning grounds. The commitment is small (as little as one-half hour each week). You will help provide much needed data on this once historically abundant, but now declining fish. The program runs from April to June. Help us launch this new data-collecting program in Harwich! From planning in advance, to support the day of, volunteers make sure that educational and fundraising events continue to grow and reach new people across the Cape. We have plenty of office space for volunteers! We need help processing correspondence, coordinating direct mail outreach, creating, organizing, and updating files, and general administrative support. Volunteers are needed for regularly scheduled trailwork, invasive plant removal, and property clean-up. Grab your favorite loppers or borrow one of ours and join us! Individual projects are also available. Help us locate and certify these important habitats throughout Harwich from March to May. Training will be held at our office in the spring. Throw on your duck boots and join us as we search for frogs, salamanders, egg masses, and more! 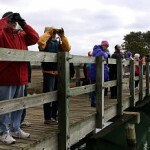 Join Cape Cod Bird Club members in monitoring and maintaining bluebird boxes at the Bank Street Bogs and other locations in Harwich. Nest box installation and repair is scheduled in February and monitoring begins in March. Learn more about specific opportunities by clicking on the positions below!